My congratulations go to you the members and the rally organisers, led by Rally Director Andrew Hayes, for putting together what looks like a truly amazing experience for us at the end of April. With 30 veteran cars and bikes participating, the rally dinner sold out and the paddle steamer Marion now also available for us, we will be very entertained and somewhat spoiled. 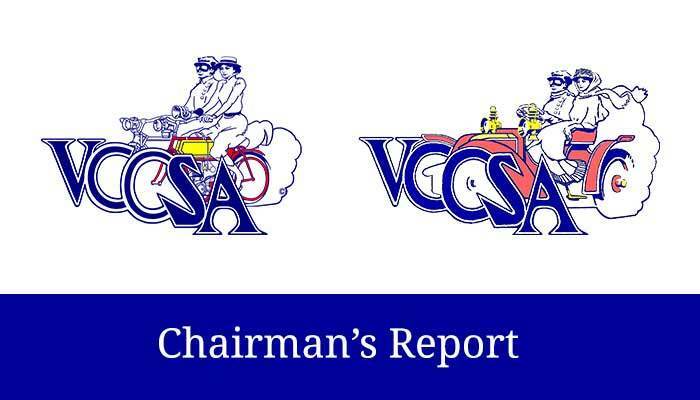 Further to this, your Committee has invited Julian McNeil to put in place a second weekend rally instalment for the VCCSA, to occur later in the year. This will be a very different event and Julian will release further details once the program has been finalised. The next few months are shaping up as a busy time for the Veteran Car Club of SA. Please check the Bulletin carefully for dates and events as there have been some changes to the calendar released earlier in the year to take advantage of opportunities that arise and allow us to use our vehicles. One significant event I would hope many of you will support is the upcoming “Vehicle Demonstration Day.” The format for this has greatly improved over the past few years and is now a great opportunity to share our vehicles with the public. This year I am hoping we can parade into the event en masse as a Club. To support this, our Rally Master has organised for us to assemble in the carpark of the Unley Shopping Centre before we head to ANZAC Highway. It will be a very short run, so hopefully many of you will be willing to take part. So get out the Brasso and shine, shine, shine and let’s see that brass glimmer! It is with great pleasure that I take this opportunity to share with you the amazing news that the Veteran Car Club of SAis working in conjunction with the Veteran and Vintage sections of the Sporting Car Club(as joint members of TAVCCA here in South Australia) to facilitate a FIVA endorsed International World Rally for 2021. Whilst we are still in the early planning and scoping stage, there has been a good deal of interest and support from both clubs Committees, the State Government, TAVCCA and FIVA, as we sound out the feasibility and organisational matters to enable a project of this calibre and size to proceed. The last Australian based FIVA World Rally took place in Tasmania back in 1993. The vision for 2021 would potentially see 400 vehicles from the birth of motoring through to the 1930’s take part in a week-long motoring festival here in South Australia. This would be a truly an amazing experience for all involved. I certainly hope you share my enthusiasm for us hosting such an opportunity.